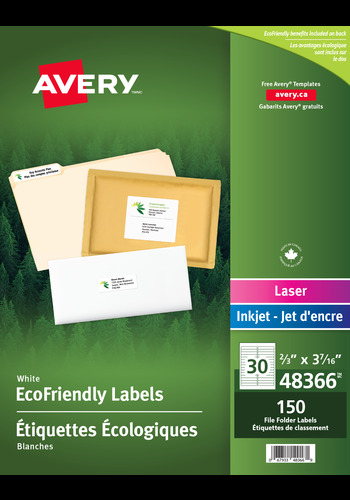 for Laser and Inkjet Printers, ⅔" x 3-7/16"
Take a step towards helping the environment while labeling folders with Avery® EcoFriendly File Folder labels. You can count on the same high-quality Avery® label while still doing your part to help the planet. Label paper and packaging are made of 100% recycled material and printed using environmentally-friendly, soy and vegetable based inks derived from renewable materials rather than solvent-based inks. Take a step towards helping the environment while labeling folders with Avery® EcoFriendly File Folder labels. You can count on the same high-quality Avery® label while still doing your part to help the planet. Label paper and packaging are made from 100% recycled material and printed using environmentally-friendly, soy and vegetable based inks derived from renewable materials rather than solvent-based inks. Labels are processed chlorine free to help cut down on harmful substances associated with the manufacturing process and use a 100% water-based permanent adhesive. All Avery® EcoFriendly labels, packaging and paper waste can be recycled to help you or your office do your part to leave a smaller footprint.